Marc-André Ter Stegen has locked the door. Barca goalkeeper made very clear in San Mamés that the defensive fragility that came to show the Barca team in the early stages of the season has been permanently buried in oblivion. The statistics speak for themselves: they have been able to stop 30 of the last 34 balls that the rivals have managed to send between their clubs. 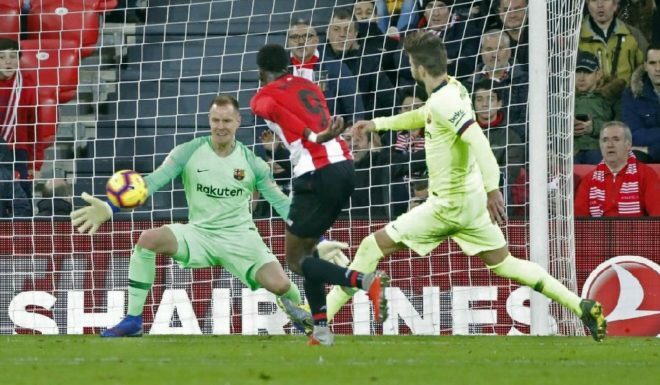 Against Athletic, he signed two interventions within the reach of only a select few: a stop by hand changed by Susaeta's shot and an action full of reflexes before a shot from Iñaki Williams . Therefore, it is not uncommon for the German goalkeeper to take the most heartfelt praise from his teammates as soon as the match ended. «Marc has been key. He has made three very important stops for us, but for that we have the best goalkeeper in the world, "said Sergi Roberto in the mixed zone of San Mamés. "It is one of the best in the world. He has shown it again and that's what the goalkeeper is for, " Luis Suárez had pointed out shortly before on the stadium lawn, speaking to Movistar Partidazo. Ter Stegen, meanwhile, preferred to throw of humility when speaking of his most meritorious interventions. "I had to stop them, yes or yes. Both are important to my confidence. The team, not only me, tried everything until the end and I am very happy to have some colleagues like that, "said the goalkeeper also on the microphones of Movistar Partidazo. In his opinion, with everything, there are things that have to be polished. "We must analyze what has not been done well, but now we have to recover and after that break we will talk about what we have failed to improve them," said the German. Without wanting to find excuses, or at least not at all, he did not hesitate to remember that the calendar, in recent weeks, has been particularly demanding for Barça. "February has been complicated and that's why I think everyone will be happy to be able to rest a day or two and continue fighting for everything. The team has been focused and eager to win until the end. Maybe we have to go a step further, but with the schedule we have it is hard, "added the Barcelona goalkeeper. Of course, his performance also deserved praise from his coach, Ernesto Valverde , no matter how much the Barça coach also let the German, in part, provoke the action that was settled with his first major intervention. "It was a clearance to the center in which we had a problem, because he had messed up, but then, he made a great stop", said the trainer in Movistar Partidazo. There were no buts, however, for his second big hand of the night. "In the second half we pushed more towards their goal, but we did not find clear situations of goal and, nevertheless, we were exposed in plays against. In fact, there was a very clear one in which Marc saved us, "he recalled in the press room. In his opinion, the team lacked clarity in some moments. Very especially, when it comes to specifying their arrivals to the rival area. "Sometimes, that point of success, of lucidity in the last section, is decisive," he said. The coach, on the other hand, is not worried in the least by the fact that Real Madrid has managed to cut four points away in the last few days and is now standing on his heels in front of Atlético. Or, at least, that's what he tried to convey. «The sensations are the same as last week. We were first, we followed first and, if the accounts do not fail me, we will be first the one that comes. Sometimes you add a lot, sometimes not so much, but this is long and you have to be there until the end, "sentenced Valverde decided to give his players a well-deserved rest: the team will not return to training until next Wednesday.